Rhapsodic (The Bargainer #1) is Now Out! I've been waiting to say this for months (actually, years): Rhapsodic (The Bargainer #1) is now out! You can find it here. This is the first book in The Bargainer trilogy, and the next book is set to come out in 2017. I hope you enjoy Callie and Des. In the next few days I'll post an FAQ page with all the questions you want answered. If you have questions about the book, or you just want to reach out, please check out my contact page and don't be a stranger. Lastly, if you read Rhapsodic and enjoy it, please consider telling a friend or leaving a review. That is the most beautiful way you can show your appreciation for my books. Click here to see Rhapsodic on Amazon. Can you believe Rhapsodic (The Bargainer #1) is coming out in just four days?! I cannot wait to share this newest series of mine with you. 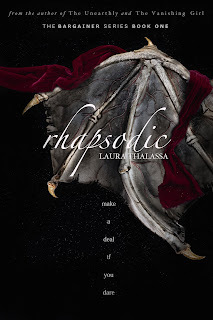 If you'd like to pre-order Rhapsodic before it releases on November 15, you can do so here. Until then, for those of you music lovers, I wanted to share the official Rhapsodic playlist. This playlist was originally loooooong, mostly because I've been working on this book for nearly three years! But I condensed it down to the few songs I felt really represented this story. I can't wait for you to have a listen. Before you do so, I want to let you know that in the coming days, I'll be posting a release announcement as well as an FAQ on Rhapsodic. I'm considering publishing a release day video, but at the moment I'm sick, so my enthusiasm for being captured on camera right about now is pretty low! But if I feel better before Tuesday, I'll totally post a video with all sorts of cool bits about the making of Rhapsodic. Until then, enjoy the playlist!